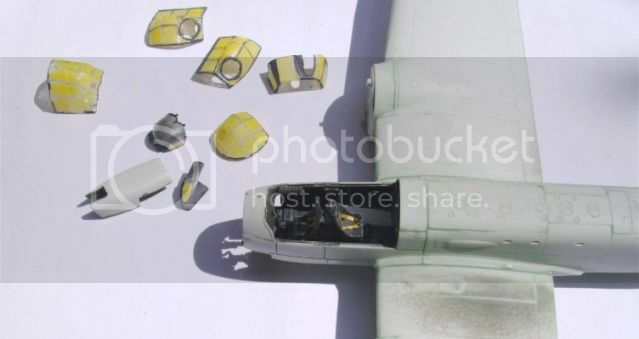 The task of masking the Revell 1/72 Ju 88 A-4 is a sizable one. Eduard has released this set of Kubaki flexible masks which will have many who have bought the kit sighing with relief. The masks and instructions are contained in a semi re sealable bag. There are around sixty eight masks for the glazed areas alone, plus six masks for the wheels. Some of the glazed areas where the shape is more complex need two masks. The flexible Kubaki masks will prove its worth conforming to the shapes. The masks are designed to help you achieve a sharp painted edge around the framework. Some liquid mask [not supplied] or spare masking tape needs to be used to fill some areas in the middle of the glazed areas. The instructions are printed on both sides of an A5 sheet of paper in grey tones. There are fifteen diagrams that illustrate step by step where to apply each mask for the glazing. Eduard use dotted lines to link each mask to where it goes. Eduard has also highlighted the non-relevant masks in white to clarify things even more. It might be an idea to colour code the dotted lines with a coloured pencils. What a really useful release from Eduard. I would really baulk at creating this many masks myself. Well done that person that designed this amazing set of masks. Nicely done Eduard. Highs: This set will save you loads of time and effort, and a few tantrums. Instructions are excellent. Well worth the money. Verdict: The person that designed this should be created a saint. Highly recommended. ..yep, I can confirm that it is! I put my Revell Ju 88 on the 'shelf of doom' way back in December when I got to the masking canopies stage. Picked it up again recently..and ended up spending a full day's session masking the clear parts with Tamiya tape..
..Hi Tim, sorry for the rather slow reply but thanks for the comments..I'd describe this kit/build as 'tricky' (aren't they all nowadays?) - lots of very small parts, some 13 build stages just for the cockpit.. getting there slowly though!